The Leyat Helicycle was a prototype vehicle created in France in 1914. 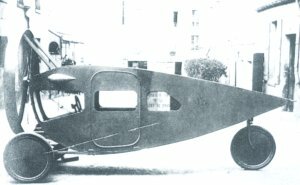 Designed and built by Marcel Leyat the vehicle was powered by a large wooden propellor attached to a radial engine at the front of the car. As the two wheels were also at the front the vehicle became very unstable and was involved in many accidents before the 3-wheeler version was scrapped and production started with a 4-wheeled version.